Villa Martine Seminyak - Kuta, Bali, Indonesia - Great discounted rates! Set in a prime location of Bali, Villa Martine Seminyak puts everything the city has to offer just outside your doorstep. Featuring a complete list of amenities, guests will find their stay at the property a comfortable one. To be found at the hotel are free Wi-Fi in all rooms, luggage storage, car park, airport transfer, laundry service. Designed for comfort, selected guestrooms offer television LCD plasma screen, complimentary instant coffee, complimentary tea, free welcome drink, linens to ensure a restful night. 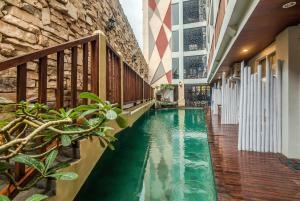 To enhance guests' stay, the hotel offers recreational facilities such as outdoor pool, massage, garden. Villa Martine Seminyak is an excellent choice from which to explore Bali or to simply relax and rejuvenate. Villa Martine Seminyak - Bali classifies itself as a 3 star hotel.